Ecuador inflation can have a big impact on Ecuador real estate and your Ecuador business. We’ll see how and look at some multi currency tips as well in a moment. “Multi currency investing now requires more than just investing in various currencies. I am on the Board of Advisers for the Liberty Street Letter which launches February 11 and occasionally am asked a question. Here is an interesting one received. Question: What currency do you think will become the ‘currency of choice’ when the current economic situation subsides? The answer ties in with our lesson today: This is a million dollar question and I do not see any clear winner because every option has a potential problem. Currently the yen is winning this role having already reached an almost high versus the dollar ever. This strength has come at a time when the euro has weakened considerably. The only practical choices are the yen and the euro… These are the two economies big enough to handle this role. Each has its own set of problems. The euro is strained due to internal difficulties between the various EC nations. Japan’s debt is high also. Both Europe and Japan have aging populations that will also pressure the currencies. The Swiss franc would be a choice except Switzerland is too small an economy to provide the world with a reserve currency. The last time investors flooded into the Swiss franc Switzerland created a negative interest of 12% per quarter on all non resident Swiss franc deposits over 100,000 SFR. We have warned about investing too much in the Swiss franc for at least a decade. The British pound is popular still since it was the reserve currency of the world before the dollar…but Britain’s debt is high also. The Chinese yuan would be a good bet if China’s production per person were a bit higher. So the US dollar is likely to remain the contender for awhile. I do not see any clear fundamental currency winner and expect some degree of currency turmoil. In the “good old days” (1970s-80s) choosing a stronger currency was easy. The US government was conducting a “Guns and Butter” policy that cost more than the government’s income. The political idea was great…spend now…let the next government worry about the payback…if you are a short term thinker. Good or not, politically it was bad economically and the deficit spending caused the US dollar to fall versus industrialized currencies where governments (especially Germany and Japan) were more fiscally prudent. Then the prudent governments learned deficit spending as well…Germany to finance the buy back of East Germany….Japan to bail out an economic meltdown. Other (most in fact) governments hopped on the deficit spending band wagon as well. So today, one great social economic problem everyone faces is the destruction of purchasing power of many currencies, all over the world, all at the same time. Investing in the playground of currencies now is like trying to choose the rising end of the teeter totter, when all the teeter totters are going downhill on a slide. Since the yen is so up and the euro low, in the medium term, I am betting on European currency gains. Our tactic has been and remains to invest mainly in European currencies but not much the euro. 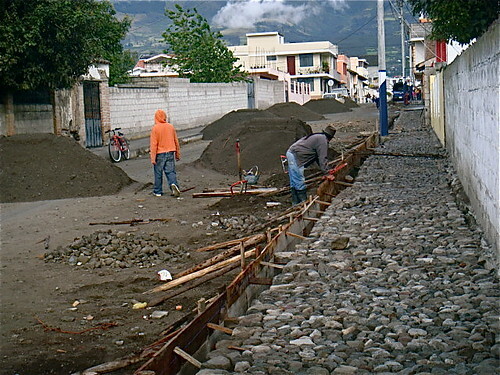 “In Ecuador’s past when the old sucre fell, Ecuador real estate prices rose even more. 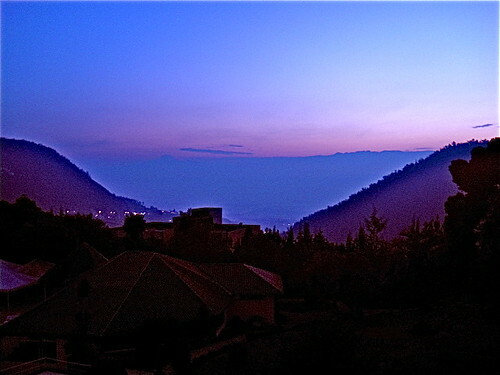 “First, Ecuadorians view property as real money. They have not trusted the sucre for centuries so if Ecuador returns to the sucre…more Ecuadorians are likely to buy real estate and push property prices higher. 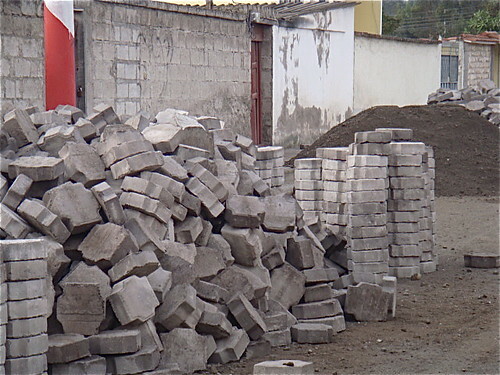 “Second, I like Ecuador real estate because it has a growing gringo market. Some Ecuador real estate markets are better than others. For example real estate that attracts both Ecuadorians and North Americans will fare best. “If Ecuador adapts the sucre and the sucre falls, Ecuador’s cost of living (for gringos who hold dollars and other currencies) will fall. See more about this at Ecuador’s dedollarization. 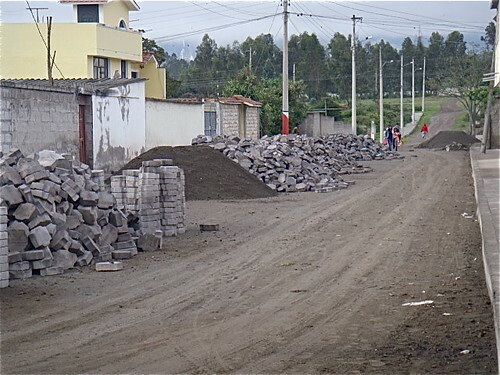 You can read this entire update as an Ecuador Living subscriber. 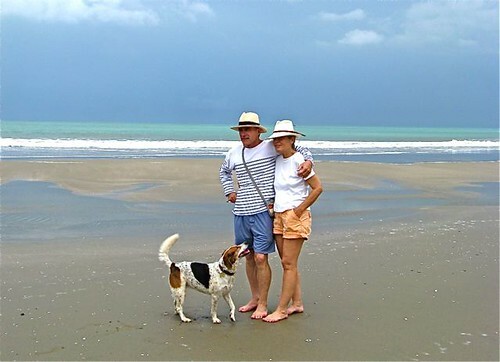 Yesterday’s first Ecuador health tip also mentioned the importance of exercise and how Merri and I walk every day when we are in Ecuador. Our walks are also useful and help us spot the best properties the minute they go up for sale. 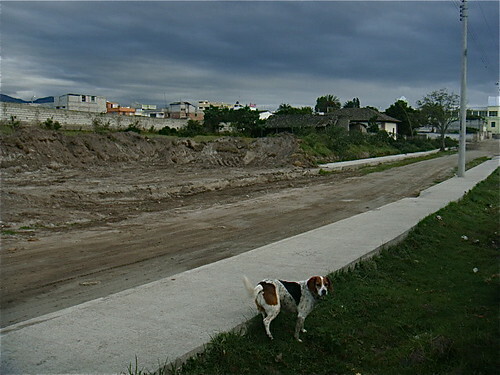 Yesterday’s message looked at how a recent area, just outside the village of Cotacachi was recently cleared for development and showed this picture. Wow! This area is really heating up! We walked there again today. Look at all the new stuff going on. We walked there about 6:45 am yesterday and the same time today. All this has arrived since then. And construction was already underway when we passed… at that early hour. How nice to be in the path of progress. Our neighbors by our farm in North Carolina have been trying to get the roads paved there for ten years. To date… “nada”. Until next message, may progress be in your path! It is with great warmth that I wish you and Merri a Happy New Year! It sounds as though your holidays were filled with family and fun. Thank you for sharing your experiences. I want to take this opportunity to tell you how thankful I am to you and Merri for all that you do. The first course I took (import/export) was so exciting and ignited an excitement in me that I had not felt in ages. I have been back several times since last February and have been doing some shows and just selling things to friends and friends of friends. I am getting more serious in my business now and am planning to work on several specific home décor items in the next couple of months. Hopefully we will get the chance to visit at El Meson if you are there when I visit. I went to Ecuador, originally, on a whim and have just fallen in love with the country and its beautiful people. I thank you and Merri for your charitable work and for the love, support, and encouragement that you show your subscribers and course attendees. I will soon be planning another trip and would like to focus specifically on home décor, such as bowls, candlesticks, pillows, linens, etc. Again, MANY THANKS for opening my eyes to so many new opportunities and ways to help others while benefitting through business ideas. I wish you and Merri all the best in 2009. We invite you to join us in Cotacachi where the real estate and import export opportunities are great (but entirely different) as well. 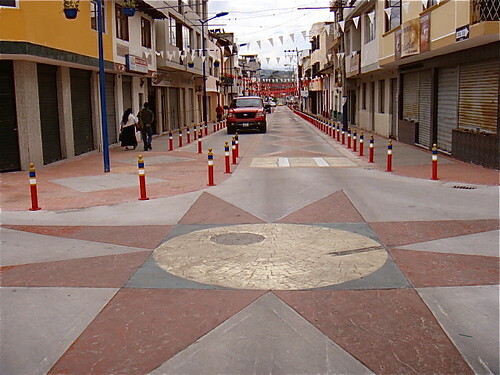 Here is Cotacachi’s main shopping street which is filled wth leather goods. 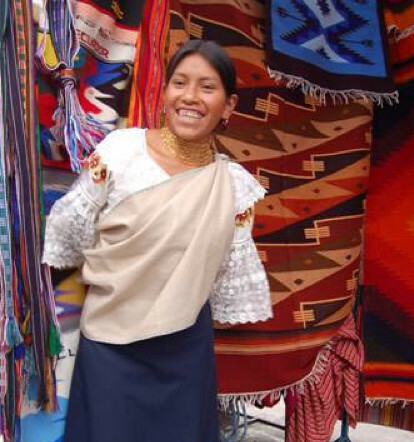 Otavalo, the largest indigenous market in the Americas is just minutes away as well. 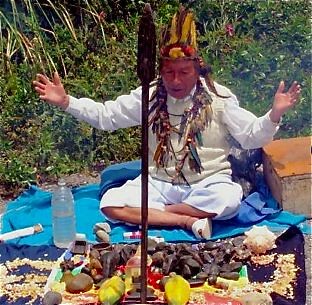 Join us in Cotacachi this February for a shamanic experience and Ecuador health tips. 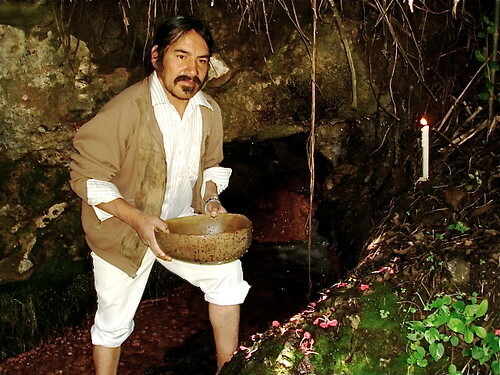 We’ll visit these sacred springs. Or join us on the coast. Better still join us all year in Ecuador! See our entire schedule of 27 courses, tours, mingos and expeditions we’ll conduct in 2009 and how to attend as many of them as you like FREE.